Absolutely fantastic movie finds Jim Carrey and Kate Winslet on top of their game as a couple who, after their relationship went down the drain, undergo a procedure to erase each other from their memories. But it’s halfway through the process that they realise what they had in the first place. A heartwarming piece of work, extremely well acted and brilliantly done (the dream sequences are unforgettable). Jim Carrey has never been more tender and believable on screen (this might well be the best performance of his career so far). Fun fact: “The title is quoted from the poem “Eloisa to Abelard” by Alexander Pope. This poem was used in Charlie Kaufman s earlier project” Being John Malkovich”. I love love love this movie! 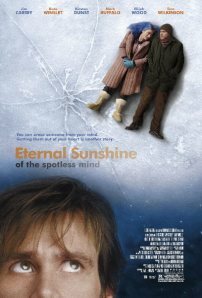 With a tight budget,Michel Gondry have done wonders here.Kate Winslet’s portrayal of Clementine Kruczynski was absolutely brilliant, she absolutely perfected her role,my favorite Winslet performance. I dare to say that this was a more ambitious and more confusing movie than “Inception” . what a great inspiring piece of art! What about Jim Carrey? Ive never seen him so good before. I loved his performance and I love this movie! sure! probably his best performance so far. I hate him as a comedian btw, but the man can act!